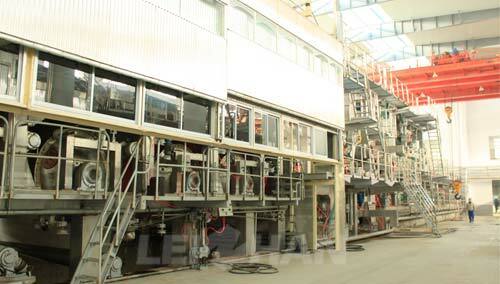 Leizhan manufacture paper machinery mainly use waste paper and wood pulp as raw material. And production line for kraft paper from paper wastes is always in high demands. We can design the suitable production line according to your production capacity and budget, and recommend the best type machine according to paper making friend’s site requirements. Kraft paper has two layers, one is top layer and another is bottom layer, in reasonable design, Leizhan paper machinery can legitimately divided the pulp into two kinds: top layer pulp and bottom layer pulp, then respectively flow into two headbox and become one at the end.